Our Lough Derg Charcoal is made from locally sourced timber within the environs of Lough Derg. Bear in mind most of the charcoal sold in shops comes from such far-away places as Africa, Argentina and China! Now that is not a very sustainable way to have a BBQ. Why not buy local Charcoal instead. Also Lough Derg Charcoal is made using the retort method to ensure against pollution and to promote greater recover. Due to transport cost, charcoal is only available in 12- 14 kg bags @ €2.50 per kg and transport is €15 per bag. Check out the link below for tips on how to improve your BBQ skills. 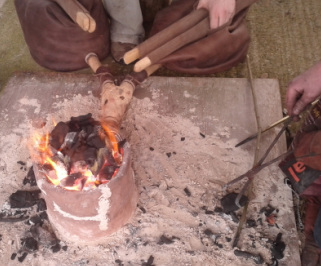 Smelting Bronze with Lough Derg Charcoal. Thanks to the crew of Umha Aois (Irish for Bronze Age) for there positive feed back on Lough Derg Charcoal. They used it recently for smelting and had very good results. It gave very good heat and as result they had to use less than the imported charcoal they would normal use.